Tiki Cat is celebrated as one of the most radically carnivore-appropriate brands on the market, but is it a safe, nourishing choice for your cat? Find out in our unbiased Tiki Cat review. We’ve analyzed Tiki Cat and graded it according to the We’re All About Cats standard, evaluating the brand on species-appropriateness, ingredient quality, product variety, price, customer experience, and recall history. Here’s how it rates in each of these six key areas. We give Tiki Cat a 49 out of 60 rating or an A- grade. Tiki Cat is owned by a company called Petropics. Before founding Petropics, Christine Hackett worked in research and development for Petco. While working with the retailer’s private label program, she became increasingly aware of the problems and potential in the pet food industry. In 2005, Christine and her husband, Robert, founded a pet food company of their own. “A lot of midline premium brands, which still have a lot of grain and carbohydrates in them, lost traction to companies like mine”, Christine said in an article in The New York Times. Indeed, Tiki Cat has gained a following with its low-carbohydrate recipes, some of which are made from nothing but meat and supplements. Since 2015, Tiki Cat has been a part of Whitebridge Pet Brands, a company formed by the merger of Cloud Star and Tiki Pet. Other brands in the Whitebridge portfolio include Dogswell, Catswell, and Buddy Biscuits. Tiki Cat is made in Thailand and describes their manufacturing facilities as “award-winning human-grade canning plants”. These facilities meet international standards for human food production. Tiki Cat explains that they source ingredients as close to their manufacturing plant as they can, including fish from Thai waters. Their fisheries are part of the International Seafood Sustainability Foundation (ISSF) and support conservation initiatives that help to protect marine environments. They’re certified by the International Dolphin Conservation Program, which aims to protect dolphins from tuna fishing. Has Tiki Cat cat food been recalled? What kinds of cat food does Tiki Cat offer? 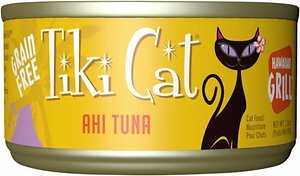 Tiki Cat focuses on wet food with a wide variety of canned and pouched recipes. They also offer a small selection of dry cat food. In total, the brand offers over 40 different flavors and textures. 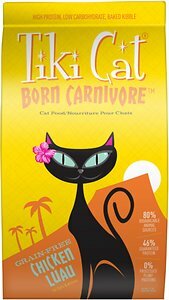 Tiki Cat’s Born Carnivore™ baked kibble diets offer 44% protein on average and are made without potatoes, corn, rice, or wheat. Canned foods in the Luau line combine shredded chicken with flaked fish including wild salmon and ahi tuna. The Grill line includes wet fish-based foods garnished with shellfish like shrimp and prawns. Aloha Friends is a line of wet food made with chicken or tuna and supplemented with pumpkin. After Dark is a line of wet food that combines muscle meat with nutrient-rich organs. The Velvet line includes smooth mousses for cats who like to lap up their meals. Finally, Tiki Cat offers a small selection of life stage-specific foods for senior cats and kittens. All Tiki Cat recipes are free from animal by-products, grains, and potatoes. They’re made without artificial colors, flavors, and preservatives. This Tiki Cat recipe is made with nothing but chicken, chicken broth, sunflower seed oil, and an array of vitamins, minerals, and amino acids. Imagine buying a can of chicken at the grocery and instead of spreading it on a cracker, sprinkling in a variety of supplements to make it nutritionally appropriate for cats. That’s Tiki Cat Puka Puka Luau. Let’s take a closer look at the ingredient list. The recipe centers around shredded chicken mixed with chicken broth and sunflower seed oil. This neutral oil is often added to wet foods as a fat source, but it lacks the diversity of carnivore-appropriate fatty acids found in chicken fat, fish oil, and other animal fats. The splash of sunflower seed oil brings the food’s total fat content to roughly 13.8% on a dry matter basis, which is significantly lower than the estimated 46% fat in a cat’s natural prey-based diet. The food’s carbohydrate content is even lower than its fat content. This is one of the few cat foods that’s completely carbohydrate-free. Cats don’t require carbohydrates or starch, but is a zero-carbohydrate and zero-fiber food ideal for cats? Maybe not. While it’s on the right track and certainly better than veggie-packed products, this food may be too digestible. It appears that cats require some form of fiber—ideally indigestible animal matter—to promote a healthy gut ecosystem. Without some form of fiber, cats may become constipated or develop other digestive issues. All told, this food is rich in animal protein with low fat and no carbohydrates, including fiber. It’s a stellar choice for cats with diabetes or IBD and anyone who’s tired of feeding their cat unnecessary plant ingredients. The food has 24 calories per ounce or 147 calories per 6-ounce can. This canned food is almost no different from the canned tuna in water or oil you might find next to the sardines in the canned food aisle. The recipe features tuna meat as the first ingredient followed by tuna broth and sunflower oil. Finally, it’s fortified with vitamins, minerals, and amino acids to make it nutritionally complete for cats. Again, sunflower seed oil isn’t an ideal fat source—cats require the fatty acids found in animal fat. Like the chicken-based food reviewed earlier, this recipe is low in fat with roughly 10% fat on a dry matter basis. Cats thrive on a high protein diet with moderate-to-high fat content and minimal carbohydrates. While Tiki Cat excels at providing the low carbohydrate content and high protein cats need, the brand tends to skimp on fat. Overall, the recipe is high in protein with low fat and low carbohydrate content. Tiki Cat Hawaiian Grill Ahi Tuna contains 25 calories per ounce or 151 calories in each 6-ounce can. This chicken recipe appears to be the most popular product in Tiki Cat’s small line of dry cat food. Like all Tiki Cat dry foods, it’s baked rather than extruded. The ingredient list begins with deboned chicken, followed by chicken meal as a concentrated form of animal protein. Dehydrated chicken liver gives the food a nutritional boost—organ meats are some of the most nourishing parts of an animal. The next ingredient is dried egg product, which might be a highly-bioavailable ingredient or could be discarded from egg production for human consumption. Tapioca flour is added to help give the food structure and increases the food’s carbohydrate content. Ground whole flaxseed is added as a source of ALA, an omega-3 fatty acid found in plants. It’s followed by both chickpeas and peas, legumes commonly added to grain-free cat foods. After these legumes are a few flavor additives, including natural salmon flavor and natural chicken flavor. The food is supplemented with brewer’s dried yeast, an ingredient rich in B vitamins. Both salmon oil and chicken fat are added as sources of fat. These types of animal-sourced fats are ideal for carnivores. The ingredient list concludes with a variety of vitamins, minerals, and amino acids added to make the food nutritionally complete. Overall, it’s high in protein with moderate fat and moderate carbohydrate content. At around 25% carbohydrates on a dry matter basis, the food is lower in carbohydrates than the average dry food. Tiki Cat Born Carnivore Chicken Luau contains 495 calories per cup. Deboned Chicken, Chicken Meal, Dehydrated Chicken Liver, Dried Egg Product, Tapioca Flour, Ground Whole Flaxseed, Whole Chickpeas, Whole Peas, Natural Salmon Flavor, Chicken Fat (Preserved With Mixed Tocopherols And Citric Acid), Brewer’s Dried Yeast, Natural Chicken Flavor, Calcium Sulfate, Choline Chloride, Chicory Extract, Salmon Oil, Taurine, Pumpkin, Iron Sulfate, Zinc Sulfate, Niacin Supplement (Vitamin B3), Vitamin E Supplement, Manganese Sulfate, Copper Sulfate, Vitamin A Acetate, Thiamine Mononitrate (Vitamin B1), Calcium D-Pantothenate, Riboflavin Supplement (Vitamin B2), Pyridoxine Hydrochloride (Vitamin B6), Biotin, Vitamin B12 Supplement, Vitamin D3 Supplement, Folic Acid, Calcium Iodate, Sodium Selenite, Rosemary Extract. What do customers think of Tiki Cat food? Tiki Cat food receives overwhelmingly positive reviews. Customers like the food’s low carbohydrate content and simple recipes. The brand is popular among cats with IBD, diabetes, and other sensitivities. The Grill and Luau lines are particularly popular, while After Dark receives mixed reviews. In 2018, an unusual complaint started popping up in customer reviews. Several buyers report finding gray meat in their cans of Tiki Cat. The company maintains that the gray color is a normal result of cooking and doesn’t affect the food’s safety. Reviews seem to back the company up on this—it doesn’t appear that any cats have gotten sick after eating the discolored Tiki Cat food. How much does Tiki Cat cost? Tiki Cat food isn’t cheap. According to the company’s feeding guidelines for a 10-lb cat, it would cost $3.42 per day to feed your cat food from the Grill line or $4.86 for the Luau line. Like most cat food companies, Tiki Cat prices their dry food lower than their wet recipes. Tiki Cat Born Carnivore dry food costs about $0.50 per day. Overall, is Tiki Cat a good choice? Tiki Cat’s wet foods are some of the most protein-rich, low-carbohydrate products on the market. With some of their foods offering zero carbohydrate content, Tiki Cat foods are an excellent option for cats with diabetes or IBD. In particular, the After Dark line is an outstanding choice. It’s a line of species-appropriate food combining both muscle meat and organs for a wide spectrum of animal-sourced nutrients. Their dry foods are—like virtually all dry foods—relatively high in carbohydrates and fail to deliver the moisture cats need, but they’re better than the average kibble, offering significantly higher meat inclusions and lower carbohydrate content. Considering that the brand has never been recalled, Tiki Cat appears to be both nutritionally superior and trustworthy. On the negative side, Tiki Cat foods are more expensive than most. You might spend close to $5 per day to feed your cat one of the brand’s wet recipes. Multiple cat homes or those with large or active cats will spend even more. Tiki Cat is available in independent pet stores and chains. Use their store locator to find a retailer near you. Online, you can buy it from PetSmart, Petco, Chewy, Amazon, Walmart, and other retailers that sell cat food. Click here to shop for Tiki Cat cat food on Chewy.